It is currently my birthday month, which means I get to pick the movies we watch. Lately that hasn’t been many due to very busy schedules. This past weekend I scanned through our Netflix queue looking for a movie that would be fairly interesting for CavWife. I chose For Greater Glory thinking this would fill the bill. It is a bio pic as the subtitle notes: The True Story of the Cristiada. The events take place in Mexico in the late 1920’s. The Mexican Revolution had some similar roots as the Bolshevik revolution in Russia. The Revolution began in 1910 and slowly morphed into a Civil War. Like many nations at the time, 5% of the people owned 95% of the land in Mexico. The powers that be courted the Roman Catholic Church to maintain stability. After the War was over, a series of anti-clerical laws were established to limit the influence of the Catholic Church in the politics of the country. They also thought this was important because many of the clergy were from Europe. The movie begins after Presidente Calle (played by Reuben Blades) has taken office. There was always a threat of a coup, and this drove his policies as well as those of his predecessor, Obregon. He had increased the pressure on the Catholic church including the deportation of foreign born priests and prohibiting the wearing of clerical garb in public. As you might imagine it all went downhill from there. The Cristiada is the name of the war between the state and the Cristeros. 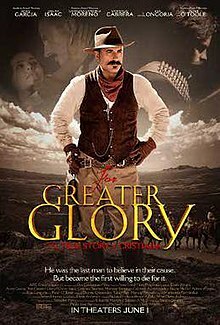 Eventually the Cristeros hired Enrique Gorostieta (played by Andy Garcia) to be their general as a result of his prominence in the civil war. While not a faithful Catholic, his wife (played by Eva Longoria) was. He was interested in religious liberty. He would eventually lose his life in the fight for religious liberty in Mexico. The movie is interesting, and also disturbing. There is a compelling enough story. At times the way it is told, and the story itself is disturbing. I know, that is an ambitious title. These things are connected in our theology; or at least they should be. When I interact with those who advocate for believers’ baptism they often point to the New Covenant which is said to be very different than the Old Covenant (it is in some significant ways). The New Covenant, they say, leads them to hold to a regenerate or pure church such that the difference between the visible and invisible churches to be nearly insignificant. While there is nothing in any of the direct statements about the New Covenant that prohibit infant baptism or demand believers baptism they think it does. They are using a good and necessary consequence argument to defend believers’ baptism. We Reformed paedobaptists also use an argument based on good and necessary consequence. The difference is that we acknowledge this but they usually don’t. The author of Hebrews refers to the promise of the New Covenant twice: in chapters 8 and 10. The author wants them to know that 1) the New Covenant is better and 2) the Old Covenant is obsolete. This does not mean the covenants are completely different and disconnected. The word used here for “new” is “kainos” instead of “neos”. “Kainos” can mean renewed rather than absolutely new. It can also refer to “more recent”. Recently there have been books released that deal with the heart of the pastor. They aren’t books about how to do ministry but how a minister should be. Jared Wilson’s The Pastor’s Justification is the second of these books I have read. Earlier I had read Paul Tripp’s Dangerous Calling. Both books are very good but quite different from one another. They form a good “Good Cop, Bad Cop Routine” when read in tandem. Tripp’s book is a dangerous read. Perhaps I should say a hard read because he is ruthless. This doesn’t mean he’s legalistic or avoids the gospel. In addressing our sin he does bring us back to the gospel regularly. His concerns, reaped from talking the numerous pastors, center on the gaps in their preparation and a sense of having arrived that cripples men spiritually. He puts his finger on many common struggles for pastors. Jared’s book is kinder and gentler. This doesn’t mean he ignores sin because he doesn’t (see the above quote). You will feel the sting of conviction here as well. He also keeps bringing us back to the gospel regularly. The point of Jared’s book is one that I got from Tim Keller a few years ago: preach as a justified man. Of course it is about more than preaching. I had the expectation that the Red Sox could make the playoffs. I saw many of the issues from 2012 resolved by the changes that the front office made. They got some guys known to love playing the game, and able to grind out at bats. The previous season they lost plate discipline. I expected the starters to return to much better form than they exhibited the previous year. I can’t see Lester and Buchholz having lost it. Guys can just have bad years, and when there is turmoil in the club house it is hard to focus on your job. So, I expected both the pitching and hitting to be better. I didn’t expect a World Series. As the season developed, I saw it as a distinct possibility particularly after soundly beating the Tigers and Dodgers late in the season. I was encouraged in that they didn’t have any big losing streaks. I was also encouraged by their resiliency. They survived after Clay’s rather inexplicable injury. They survived season-ending injures to the 2 men competing to be the closer: Hanrahan and Bailey. It was disconcerting to see Miller also go down with an injury, but they had enough depth to deal with his loss in the bull pen. It was Pedroia, in my mind, that set the pace for the team. He suffered a thumb injury in the season opener and kept playing. His power numbers were down, but he still hit for average and still played exceptional defense, earning a Gold Glove award. A tragedy like the Marathon bombings could have distracted them. In this case it drew them together and provided them with additional motivation. Some analysts have said they took off after this, but they were playing great ball with great results before the Patriots’ Day tragedy and the following hysteria until the brothers were killed and captured by authorities. One concern was their hitting against the elite pitchers, particularly lefties. Sometimes funny things happen and the Red Sox ended up facing 3 of the best pitching staffs in the Rays, Tigers and Cardinals in the playoffs. Not an easy assignment. Thankfully the Red Sox had a pretty good staff of their own. Ellsbury carried them offensively in the first round. Papi was a consistent force in the last 2 rounds. 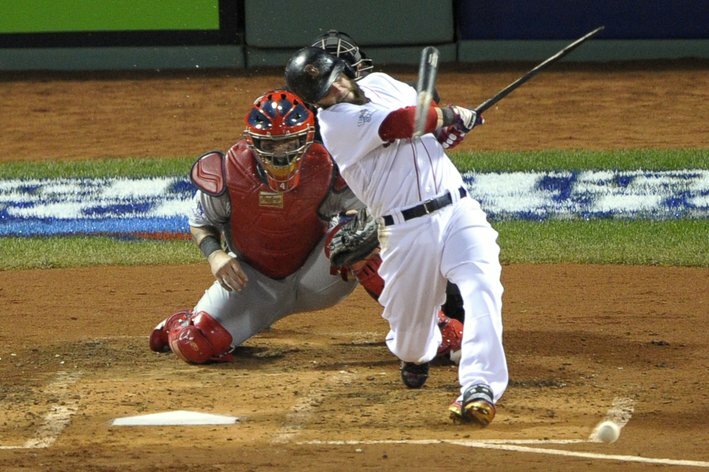 There were surprising contributions from Gomes, Victorino and Napoli who struggled offensively. They had just enough offense to win these pitching battles. It ended up being a very satisfying.